The Scripps Cancer Center—Stevens Division is located at Scripps Memorial Hospital in La Jolla, California, and is part of the San Diego County–wide Scripps Health cancer care network. The field of ovarian cancer is an active area of research, with a number of potential approaches showing promise in improving outcomes. Targeted therapies have made advances in this disease, and experts are learning how best to exploit these. I am 60 years old and an ovarian cancer survivor. I’m also an emergency department doctor who usually is treating people, making diagnoses, and being the one in charge. On November 3, Freedom Plaza in Washington, DC, was an emotional center of activity as the third annual National Race to End Women’s Cancer began and ended there. 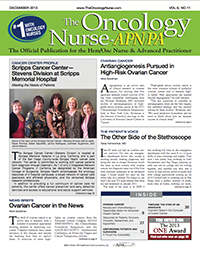 This month’s issue of The Oncology Nurse-APN/PA (TON) has a focus on ovarian cancer. We update you with some of the latest research as presented at the European Cancer Congress (ECCO/ESMO/ESTRO), the Chemotherapy Foundation Symposium, and the AACR-NCI-EORTC International Conference on Molecular Targets and Cancer Therapeutics. Writing about ovarian cancer this month provided me with the chance to reflect on how things have changed not only in treatment, but also in research over the past several years since I entered the world of medicine as an advocate.